Funny how when I make a salad, sauce or spread for a gathering of friends, the recipe always turns out to be from the Moosewood Cookbook. Not kidding. For flavor profiles that were developed back in the crunchy ’70s, the Moosewood’s recipes really seem to be a hit with people in the 2010s. Their popularity doesn’t seem to have anything to do with being mindful of healthy eating and instead has EVERYTHING to do with the fact that this food tastes awesome. Good-tasting food is an instant classic. The most recent dish to receive the “Oh man, I seriously need this recipe” comment is Spicy Eggplant Relish. Keep it in an all-veggie-ingredients-minced form, or mash it into a chunky puree after cooking. In either state of consistency, it can be used as a topping for crackers and pita, as a sandwich spread, or even tossed onto a veggie burger (or a real burger if you’re into that kind of thing). And don’t let the “spicy” descriptor dissuade you. You’re in control of the spice. Make it as light or spicy as you wish. 1. Heat oil in pan. Add onions, eggplant, salt and cumin. Saute on medium for 15-20 minutes or until the eggplant is tender (but not mush). 2. Add in the pepper. Saute for about 8-10 minutes. 3. Stir in garlic and lemon juice and continue cooking another 5 minutes. Sprinkle in the cayenne, let it sit for a bit, then taste. Add more if you need more heat. Same goes for salt. Mash or not to mash, it’s up to you. Serve it straight away or let it come to room temperature. Cold is good, too, straight out of the fridge, but I prefer it room temp. 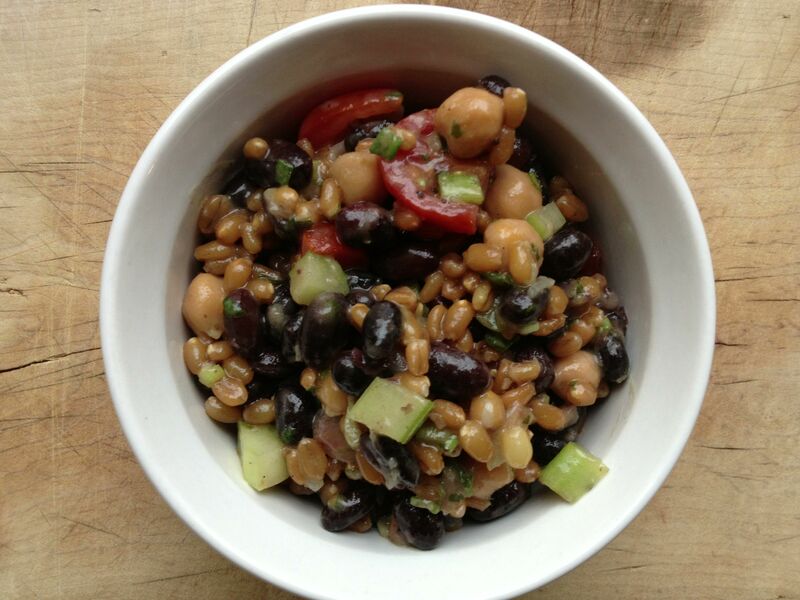 And if we’re cooking up our own beans, we might as well make our own favorite bean-based spread, right? 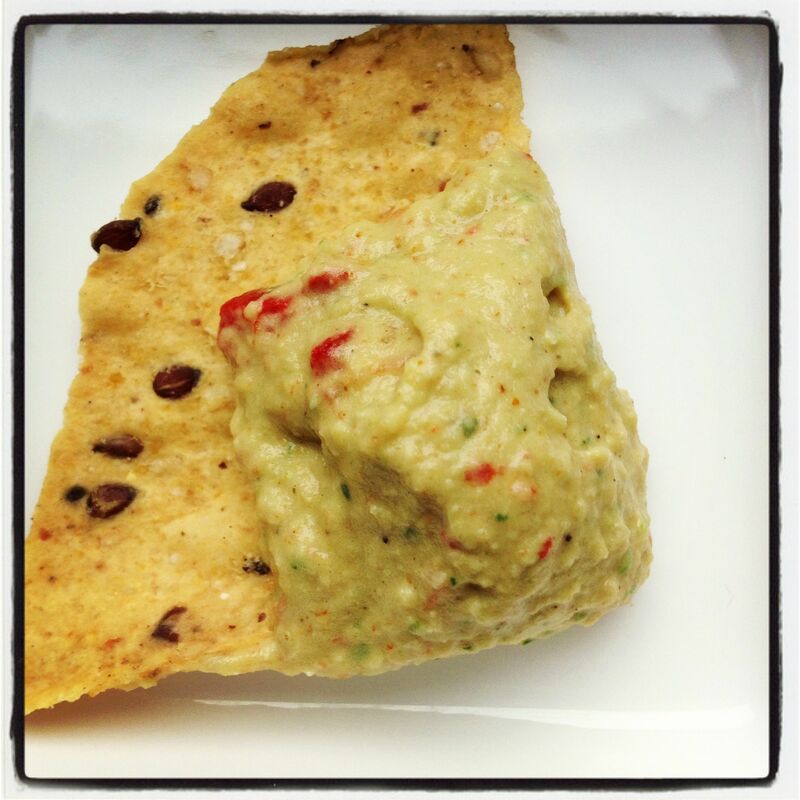 I’m speaking of hummus, of course, made with those funny looking little chickpeas (aka garbanzo beans). I’ve written about hummus here before, but after making several batches of the stuff, I was left disappointed. Too thick. I wanted the creaminess you’d find in the off-the-shelf brands. Jennifer found the solution—or very nearly—with a recipe from The New Moosewood Cookbook. Not completely creamy as we had hoped, she adjusted and tasted and made batch after batch until finally, she made the perfect consistency. The secret? Adding in some of that aforementioned bean broth and reducing the amount of tahini. Oh, and adding in a roasted red pepper. 1. In a food processor combine the garlic, parsley and scallions, and whir up into a mince. 2. 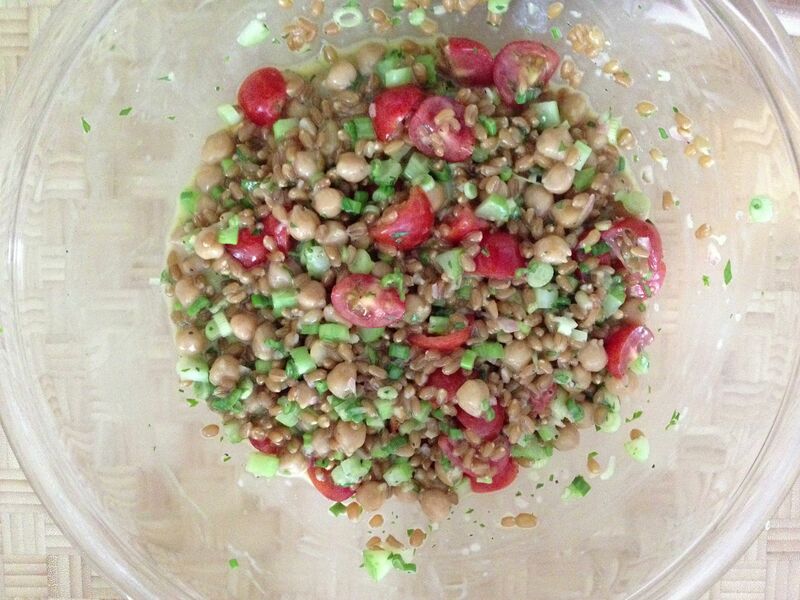 Add chickpeas, tahini, lemon and salt. Puree into a paste. 3. Add the cumin, sumac and paprika as you add some of that reserved bean cooking liquid—try about 1/4 cup—and process. Add more liquid by the tablespoon until you find the consistency right for you. Careful with the sumac—you may like just a tad, so taste before adding any more than a 1/4 tsp. 4. Add the red pepper at the very end and pulse the food processor until it breaks down the red pepper. We’re not looking for a completely pureeing of the pepper. We just want it broken down into bits. 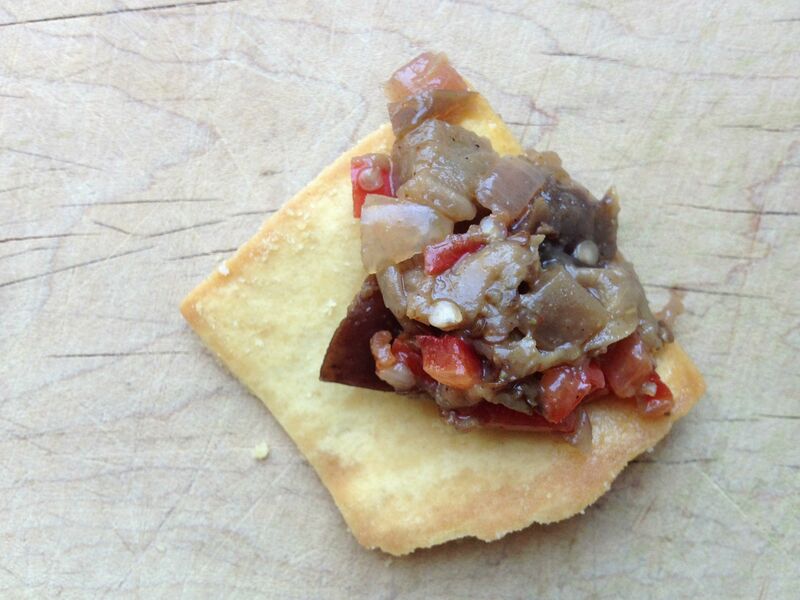 It’s great on a chip, on this awesome cracker we made last week, or—my favorite use—schmeared on a Roasted Eggplant on Whole Wheat Sandwich. I’m a fan of tofu. Not a crazy fan, but a fan nonetheless. And I’m not sure how it happened. Omitting red meat and poultry from my diet accounts for some of my fandom, I guess. Quite honestly, I am just going to let me fondness of tofu exist for what it is. Why bother explaining, right? 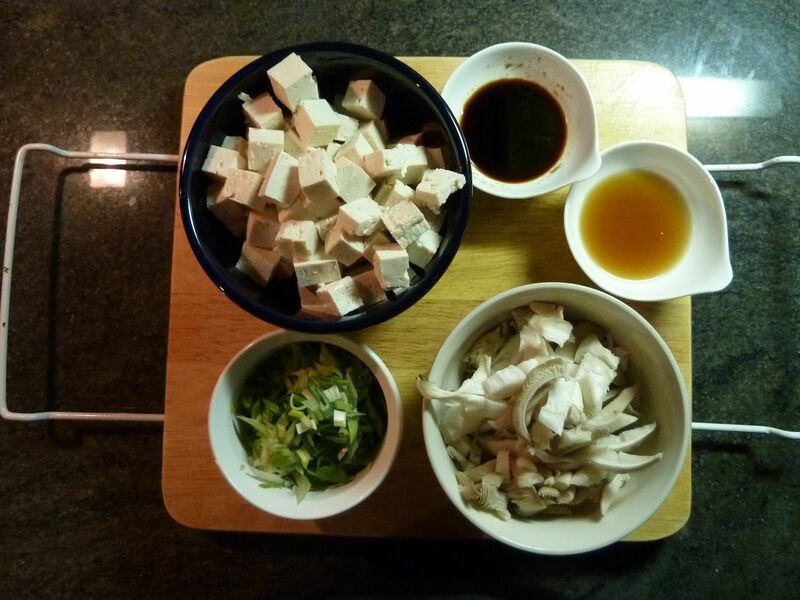 The best tofu I ever had was in a take-out dish from a Chinese restaurant in Ithaca, New York, about 18 years ago. The name, the flavorings, the accompaniments all escape me now. The one piece of the dish that remains in my memory is the tofu. Crispy on the outside. Soft on the inside. The closest thing to a McDonald’s french fry this side of the Golden Arches. I want that. I crave that even. In the absence of that crispy tofu dish, I’ll take this tofu noodle soup. Soy sauce is in there, but it’s not too salty. And the hoisin gives it that … umami. There, I said it. Umami, that fifth and most flavorable of the basic tastes. A bowl of this broth will satisfy me for lunch. The tofu and noodles make it a real deal meal. I’ve adapted this recipe – and I keep adapting each rendition of it – from a VegNews Magazine newsletter. I found that the original recipe had too little broth and way too many noodles. A halving of this and a doubling of that with on-the-fly adjustments takes care of that problem. In a large pot, saute the onion in about 1 tbs of oil over medium-high heat until translucent, about 5 minutes. Add the garlic and ginger and saute for another 30 seconds or so. Stir in hoisin, soy and broth. Bring to a boil. Lower heat to a simmer and let cook for 15 minutes. Stir in tofu, noodles, vinegar and hot sauce. Now, here’s an embarrassing thing: I have JUST NOW realized the recipe calls for cooking the noodles FIRST, then adding them to the pot. This explains a lot. Well, adding them at the end is fine, too—just simmer them in the broth for about 5 minutes or so. 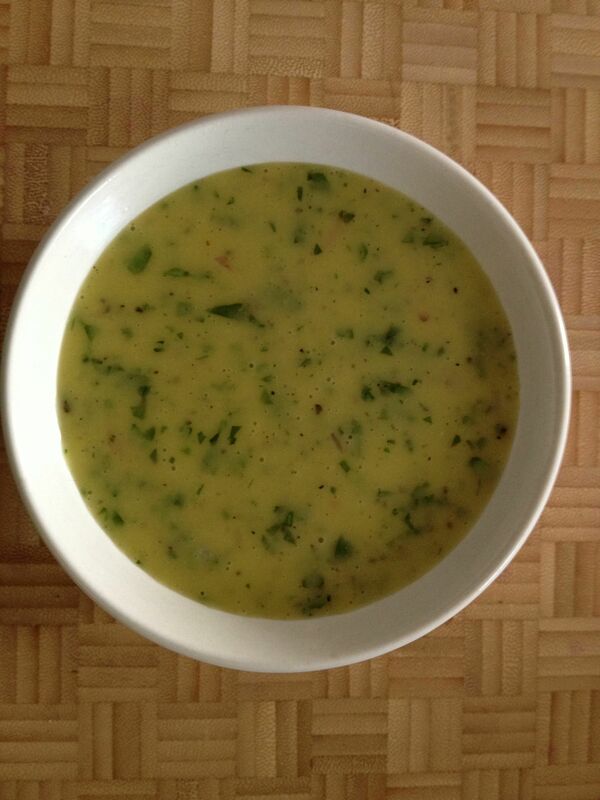 Serve soup in bowls and sprinkle with scallions, sprouts and/or cilantro if you so choose. Next time, I’ll boil up the noodles beforehand THEN add them to the soup and report back to you if there is a major difference. Meanwhile, enjoy! Pesto makes me happy. It just does. Just like the pop of a champagne bottle means something celebratory is about to happen, the knowledge that pesto is in a dish means something tasty is about to be experienced. Basil is just the tip of the pesto iceberg. It’s the easy and expected version. But when the garden presents one with an abundance of other herbs, it’s a prime opportunity to explore other pesto flavors. 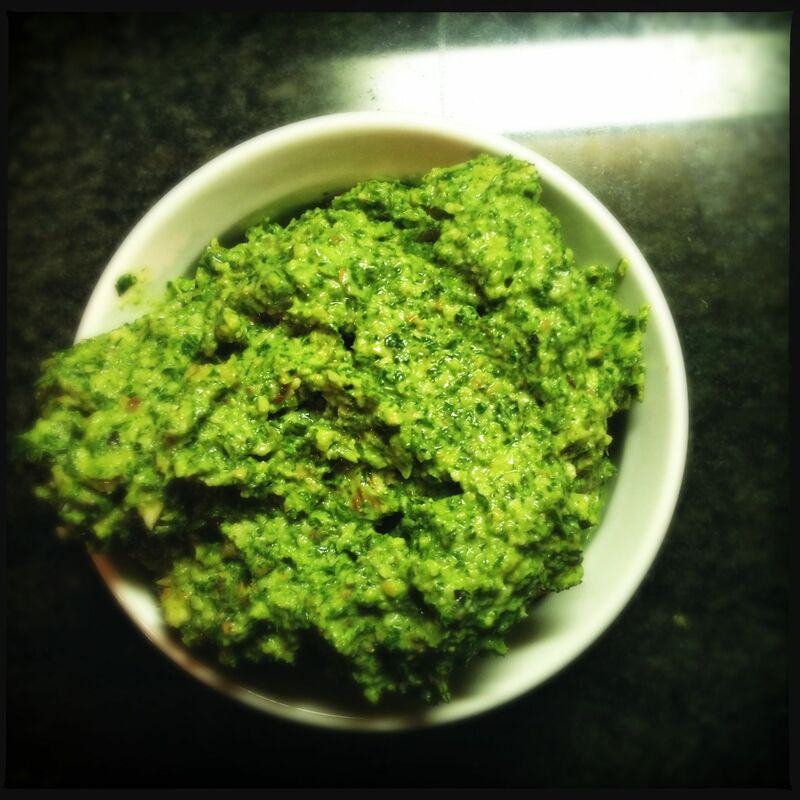 That’s how this batch of cilantro pesto came about. A 3-ft. row of cilantro plants was beginning to bolt (i.e. grow quickly and produce flowers), and rather than let it go to seed, I opted to harvest it all. And what’s the best way to use large amounts of herbs? Pesto. Like anything with cilantro, this pesto goes pretty darn well with Mexican food. It’s also tasty spread inside a grilled cheese and as a base for a pizza. And the best thing about this version is … it’s accidentally vegan. -Place all ingredients except lime juice and oil in a food processor and pulse several times to chop finely. -With the foodpro on, add the juice and oil in a steady stream. If you like your pesto saucy, add a bit more oil. All my pesto recipes come from the The Moosewood Kitchen Garden cook-garden book. The dill pesto recipe is also a keeper. I’ll share, but first my dill needs to grow a bit more. Exciting stuff that you most likely stay away from. Am I right? “Meh, whatever. I’ll have the chicken,” is what you’re saying. The best tofu I’ve ever eaten was takeout from this hole-in-the-wall Chinese place in Ithaca, New York, about 18 years ago. It was a bit spicy with a shockingly crisp texture. No idea what they did to it but I can still remember how tasty it was. 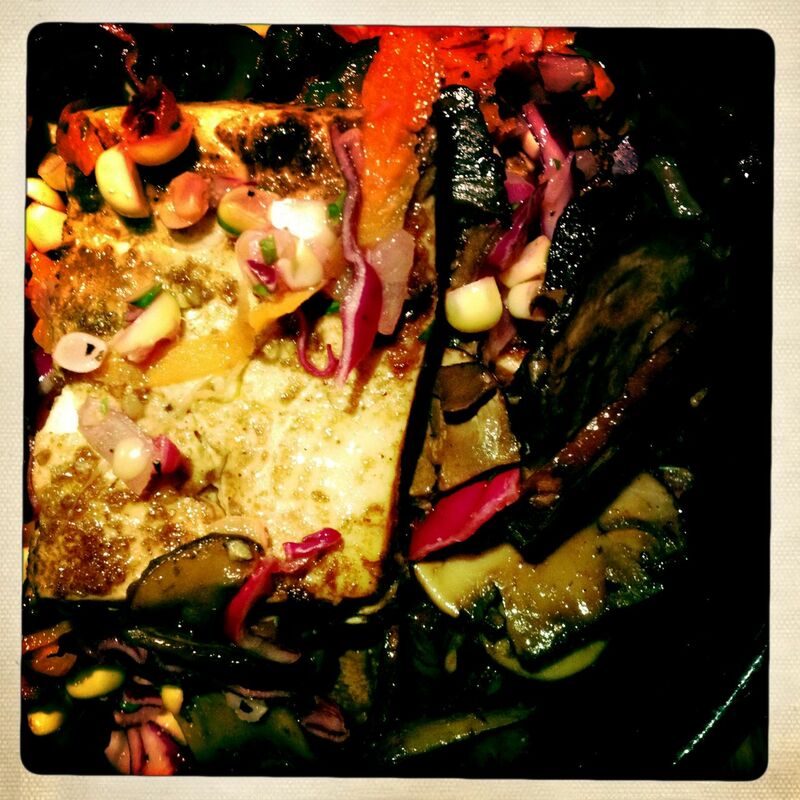 While trolling the Web in search of what to do with tofu, I came across a fabulous marinade. And by fabulous I mean I had all the ingredients on hand and it was super-simple to make. The recipe has been on a Post-It Note on the fridge for about 8 months now, and before I lose it down that mysterious gap between the icebox and the counter, I thought I’d post it to Dainty for safekeeping. 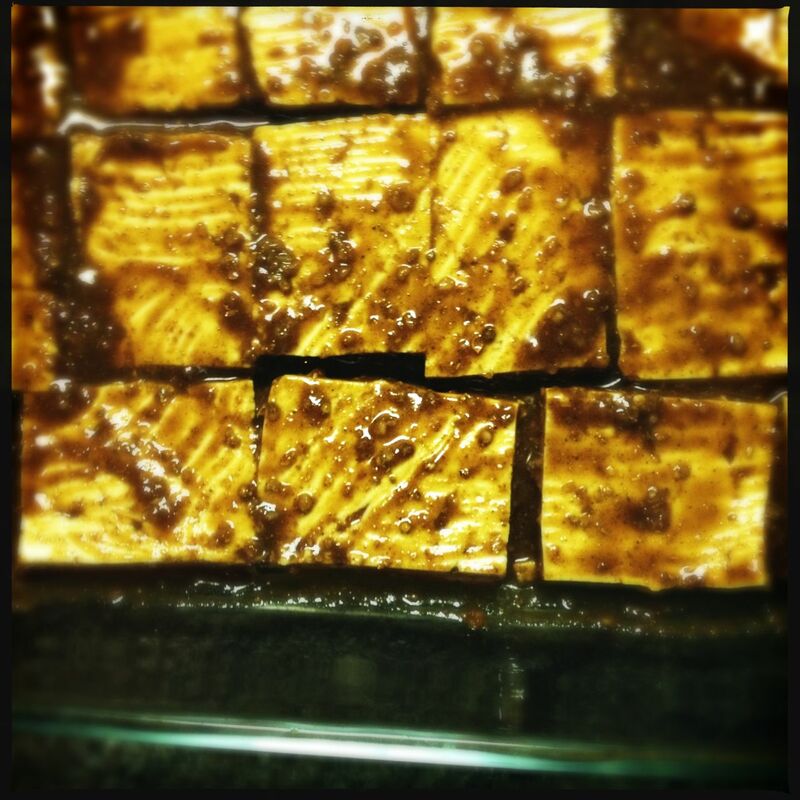 Okay, so … you marinate this tofu baby. Then what? The cooked marinated tofu slabs go well with an Asian-style slaw. Put both in a wrap or on top of brown rice. A little added soy sauce is a good addition for the latter, as well. *This recipe easily doubles BUT think twice before doubling the cayenne. A double recipe will more than adequately cover a standard block of tofu cut into 1/4-inch slices. -Combine all ingredients in a tall-sided container and whir up with a hand-held immersion blender. Or, put in a regular blender. Blending isn’t totally necessary, but I feel it gives the marinade more body than just a simple whisking. It then holds onto the tofu better. -Brush overtop 1/4-in. tofu slices, and the sides, too, if you wish. You may have extra marinade – keep that around to pour on top of your wrap or tofu rice bowl. -Let sit in the refrigerator for an hour or two. Then place slices bottom-side down in a medium-hot pan. Flip after 3 minutes. Flip again after three minutes—this helps get the marinade onto the side that wasn’t brushed. We used the marinated tofu in a brown rice bowl along with a raw corn-cabbage slaw and some leftover sauteed mushrooms that we reheated in the same pan used to cook the tofu. A sprinkle of nama shoyu or regular soy sauce gave the dish a nice pop. What’s your favorite tofu marinade? Please share below – it’s good to have more than one in your recipe book! Hearty soups … yes, I love them. And the ones I make are nearing the definition of stew. But every once in a while I will be in the mood for something light, breathy and brothy. This Asian-Inspired Soup is a riff on something Mark Bittman published in March 2011. He gave three simple (very simple) recipe suggestions in each of four categories: creamy, brothy, earthy and hearty. The second and third recipes are slight twists on the first in each category. By the end of making the twelfth, he says, you’ll never need to follow another soup recipe. With a package of firm tofu and some leftover chickpea broth (remember that from Pressure Cooker Basics? ), I twisted Mark Bittman’s own Asian twist on brothy soups. 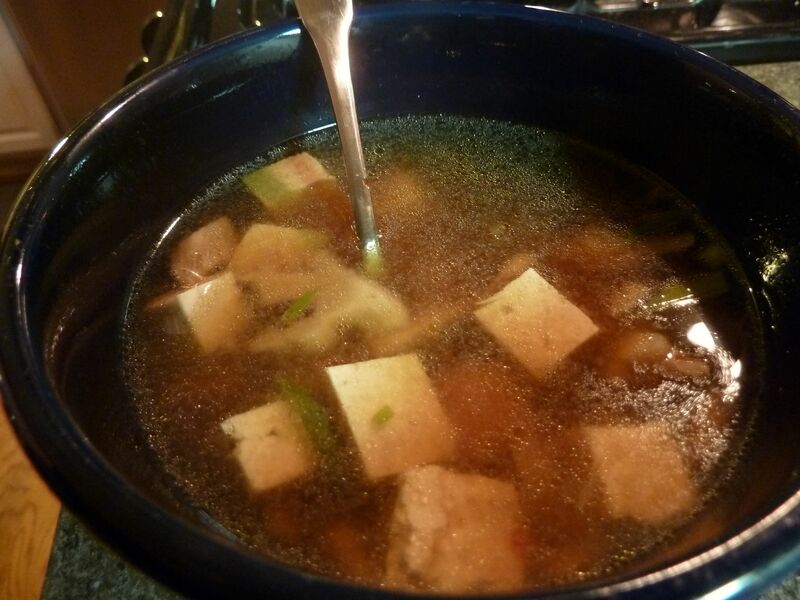 -To a large pot add the water or broth, scallions, tofu, mushrooms, soy and sesame. -Heat over a medium-high flame to just boiling, them bring to a quiet simmer, partly covered. Let simmer for … 15 minutes? 20 minutes? It’s up to you and how tender you like your oyster mushrooms. Check it at 15, then check the mushrooms every few minutes. 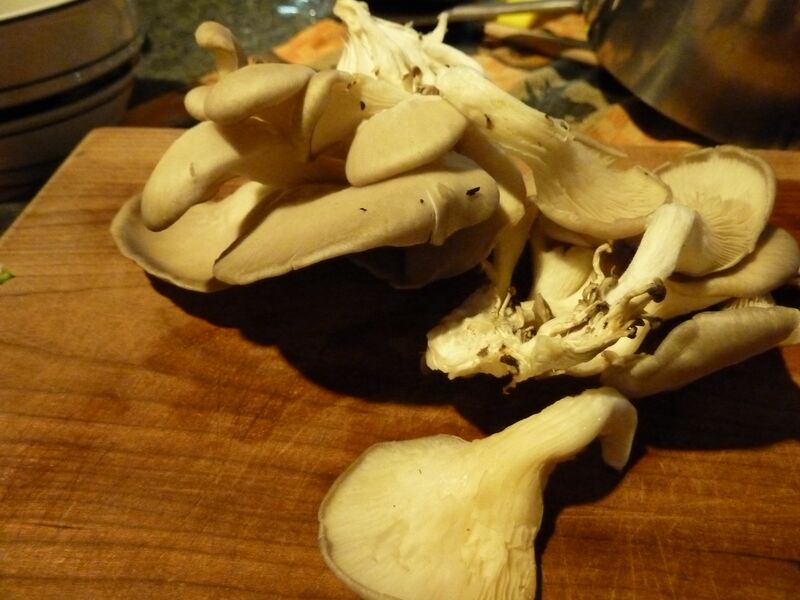 Oyster mushrooms - aren't they just beautiful? -Ladle into bowls. Garnish with a few chopped scallions. You might enjoy a crispy baguette to dunk. Seriously, I tried to make this soup sound difficult/complex/sophisticated/finicky. But that’s just impossible. This soup is just way simple. And delicious. 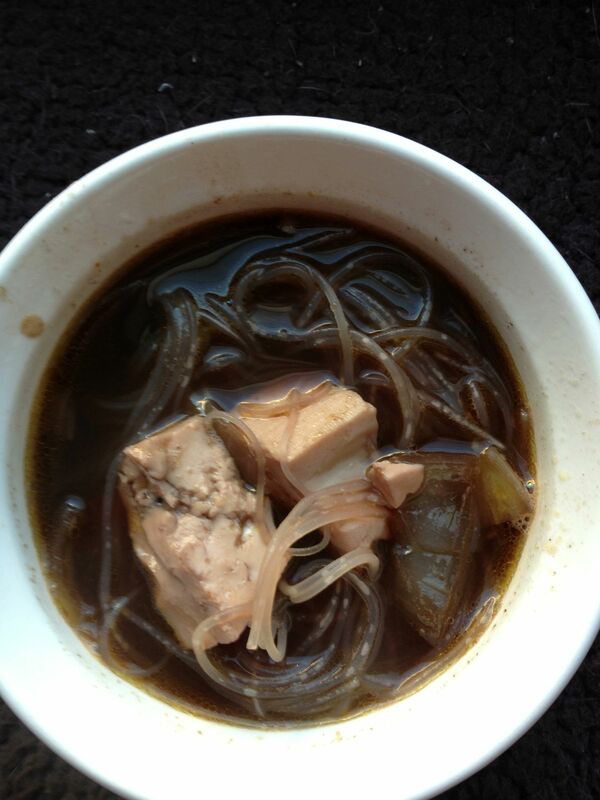 Any Asian-inspired and simple soup suggestions or ingredient ideas? Leave a comment and let me know. You are currently browsing the vegan category at The Dainty Dot.